Because vitamin B has many forms and functions we will look at each of the B vitamins individually. We’ll start with B1…makes logical sense right? 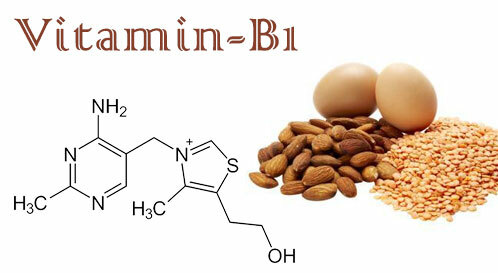 Vitamin B 1 is a water-soluble also known as Thiamin. A water-soluble vitamin means that any excess vitamin is disposed from the body by urine. This vitamin is available naturally through foods, can be added to food products such as cereal, and is available as a dietary supplement. 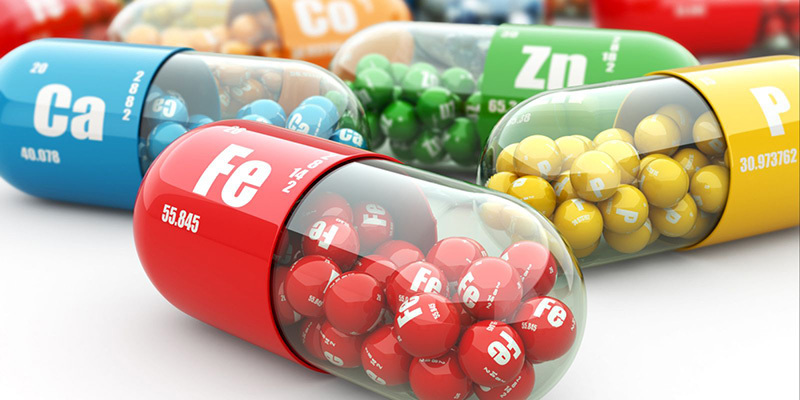 Vitamin B1 is responsible for many chemical reactions in the body. One of the most important roles the vitamin has is helping cells convert carbohydrates into energy. Carbohydrates are important for providing energy to the nervous system and brain. Because vitamin B1 helps create energy, it is crucial for growth and development of the body. Thiamin is also important for muscle contraction and conductivity of nerve cells. This is important for maintaining a normal heart beat rhythm. Thiamin is sometimes called the “Anti-Stress” vitamin because it helps the brain deal with stressful situations and helps straightening the immune system. And lastly, vitamin B1 is helpful in creating pyruvate. Pyruvate is a chemical responsible for producing lactate, which warns the body when oxygen. For example, you are lifting weights and pain develops in your arm muscles, this is lactate telling you that your muscles need a momentary rest before continuing exercise. How Much Vitamin B1 Do You Need? The National Institute of Health recommends these doses to maintain healthy Thiamin levels. Enriched grains and whole wheats like bread, cereal, pasta, and rice. Theres also beef liver, black beans, trout, tuna, clams, mollusks, pork, eggs, squash, oranges, corn, yogurt, nuts and lagoons. Because excess Thiamin is disposed through the body, it is rare for overdose effects to occur. However, because thiamin is linked to the contraction of heart muscles, too much vitamin B1 can cause irregular heartbeat, low-blood pressure, and other cardiac problems. Vitamin B1 deficiency is much more common and dangerous. A lack of Thiamin can cause fatigue, confusion, mild psychosis, and nerve damage. Long term deficiency in early stages can cause confusion, short-term memory loss, weight loss, anorexia, and muscle weakness. In late stages, Wernicke-Korsakoff can develop. This is a two stage diseases. First stage known as Wernicke encephalopathy, or disease affecting the brain. Symptoms include mental confusion, ataxia, and ophthalmoplegia or paralysis of muscles in eye. Without treatment 20% of patients die from Wernicke and those who survive then develop Korsakoff psychosis. This type of psychosis includes severe short-term memory loss, loss of long term memory, hallucinations, and confabulation. There are groups of people who are more prone to vitamin b1 deficiency and that includes those who have alcoholism, are elderly, have diabetes, AIDS/HIV positive, and people who have gone through bariatric surgery or surgery performed on stomach or intestines to promote weight loss. Be sure to take your vitamins at recommended doses to live a healthy and safe life. 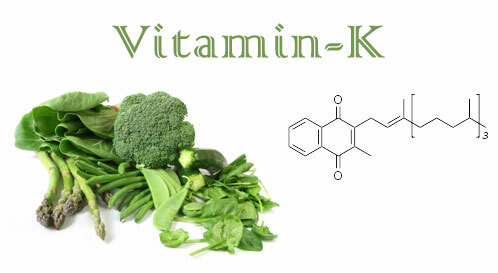 Vitamin K, like vitamin A, is actually a generic name for a group of similar organic compounds. Vitamin K comes in three forms known as: Vitamin K1 or phylloquinone, vitamin K2 or menaquinone, and vitamin K3 or menadione. Vitamin K1 and K2 are natural occurring vitamins, phylloquinone can be found in green vegetables and menaquinone can be found in meats, cheeses, and can be synthesized by the body’s good bacteria. Vitamin K3 is a man-made synthetic vitamin also called menadione . Controversy is common about K3 because of its synthetic nature. The vitamin is actually banned from over-the-counter medications but is also common in pet foods. Consult your doctor before taking menadione supplements. Vitamin K is most known for its job in helping with blood clotting but most people over look vitamin K as an important part of our health. Without vitamin K cuts and wounds would be unable to heal because the blood platelets can’t clot. Vitamin K has also been known to help with bone maintenance, prevent heart disease, and elderly people take more to help with osteoporosis. Vitamin K and D work together in the body, its believed that when the level of one is low, the other vitamin would work to its full benefit. And because most people are vitamin D deficient, they automatically become vitamin K deficient as well. The National Health Institute recommends these doses to maintain a healthy amounts of vitamin K.
Leafy dark vegetables like green lettuce, kale, spinach, romaine lettuce, parsley, Swiss chard, broccoli, cabbage, and Brussel sprouts. There’s also vitamin K in meats, eggs, beans soybeans, and strawberries. Miso and Natto have large amounts of vitamin K as well. Overdosing on vitamin K1 and K2 is almost unheard of since most people have a vitamin K deficiencies. Although diseases that effect clotting can worsen with too much vitamin K. There is also an effect on bile production with high amounts of vitamin K but can be treated with bile supplements. Its not recommended to take K3 or menadione because its man made but this is not backed by any scientific evidence for or against menadione. Too much K3 can cause damage to liver, red blood cells, and jaundice or yellowing of the skin. Worldwide, vitamin K deficiency causes death in infants because of the bodies inability to clot wounds. Those who are deficient in vitamin K are known to bleed and bruise more easily then those who aren’t. Adults are less likely to suffer from vitamin K deficiency because of the amount found in fruits and vegetables plus the bacteria in the gut that produces vitamin K.
Be sure to take your vitamins recommended for your body to live a healthy life. Vitamin A is actually a generic term for organic compounds related to each other and are known as retinoids. 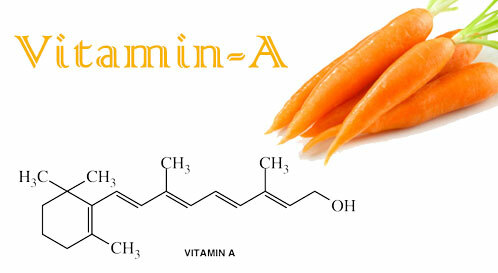 Vitamin A is also fat soluble, meaning the vitamin can be stores in the fat cells of the body. This makes it possible for your body to store too much of the vitamin. There are two forms of vitamin A: preformed or retinol vitamin A which is found in animal meats, and provitamin A or carotenoid vitamin A which is found in fruits and vegetables. Preformed vitamin A is easier for your body to absorb because it is able to convert into retinol by itself while the body must use energy to convert provitamin A into retinol. Both forms will eventually become retinoic acid, the retinoid most used by the body. Vitamin A is important for maintaining healthy skin, immune function, reproduction, cellular communication and reproduction, bone, teeth, mucus membranes and other soft tissue. Vitamin A is known as a retinoid because it helps form pigments in the retina of the eye which help with low light vision. A sign of deficiency is being unable to see at night. Though not proven, a diet with good vitamin a levels can help prevent measles in children and certain cancers like: breast, colon, cervical, esophagus cancer plus melanoma. There are also topical versions of vitamin A that can help prevent acne and moisturize skin. Foods that contain high levels of vitamin A are: Cod Fish liver, eggs, fortified cereals and milk, orange and yellow fruits, broccoli, carrots, pumpkin, sweet potatoes, and other dark leafy greens. Consult your doctor and have your vitamin A levels checked to get a dose made specifically for your body. Overdosing on vitamin A, or Hypervitaminosis A, is possible because of its fat soluble nature. Acute toxicity is when one ingests large amounts of vitamin at one time while chronic toxicity is the slow buildup of the substance over time. Acute symptoms are bone pain, skin changes, and vision changes, drowsiness, irritability, abdominal pain, nausea, vomiting, and increased pressure in the brain. Chronic symptoms include these along with possible liver disease, osteoporosis, calcification of tissues, kidney damage, and pressure change in the brain. Also confusion, respiratory infection, hair loss, jaundice, ulcers, changed vision, inflammation of bones, bone pain, poor appetite, dizziness, nausea, vomiting, sunlight sensitive, rough, dry, itching,or peeling skin, and cracked fingernails. These conditions can worsen in children and infants including: softening of bone, double vision, bulging eyes, stunted growth, measles and coma. 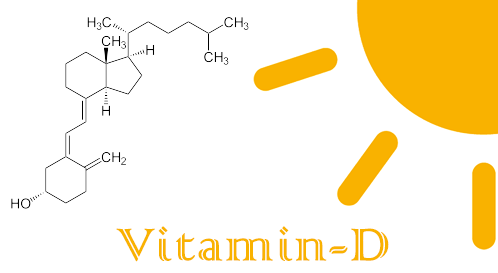 Vitamin D is a fat-soluble organic molecule important for calcium absorption and strengthening of bones in the body. A fat-soluble vitamin means that an extra portions of the vitamin are stored in the body’s fat or liver for use when vitamin levels become low. Between 80% to 90% of the vitamin D is absorbed through the skin through sunlight and because few foods carry vitamin D, its the best way to get your daily dose to maintain a healthy lifestyle. The amount of vitamin D your body absorbs through the sun is determined by the amount of melanin in your skin. Melanin is what protects the body from the suns harmful UV rays. The more melanin you have, the less vitamin D is absorbed and the longer one would need to stay in the sun to get the recommended amount of the vitamin. Those with darker skin have more levels of melanin then those with fair skin. First, vitamin D promotes calcium absorption in the intestines, calcium would be useless to the body if it cannot absorb it. Vitamin D also regulats levels of phosphorus and calcium in the bones. Because of this Vitamin D is just as important to maintaining strong bone health as calcium is. The National Institute of Health recommends these doses for healthy vitamin D levels. Note that these charts are based for those who have limited sun exposure and levels vary with skin type. Not enough scientific research as been done to determine specifically how much sunlight exposure is needed for those with darker skin. For fair skin doctors recommend 10 minutes and for darker skin between 20-30 minutes. In the world today, most people suffer from vitamin D deficiency. Vitamin D deficiency can be linked to depression, bone pain, muscle weakness, headaches, and general fatigue. However, because many people suffer from vitamin D deficiency, their bodies become accustomed to the lack of the vitamin and may not experience any symptoms at all. Its important to go to the doctor and get your levels checked. Chronic vitamin D deficiency can cause rickets in children and breastfeeding babies and osteomalacia or osteoporosis in adults. Links to colon, breast and prostate cancers have been recently discovered by doctors along with type 1 and 2 diabetes, hypertension, glucose intolerance, and multiple sclerosis. Too much vitamin D can be just as deadly as too little. Because vitamin D is stored in the body, it can easily build up to toxic levels. These levels can’t become toxic by too much sun exposure but by dietary supplements. Problems such as pancreas cancer, cardiovascular issues can occur. Increase in vitamin D will increase calcium levels causing calcification of tissue. Cases of anorexia due to weight loss has also been reported. Be sure to consult your doctor to discover your recommended vitamin D levels in order to maintain a healthy lifestyle. Everyone has heard of vitamin C but not everyone knows about how it works and what it does to our bodies. The first thing to know about vitamin C is that it is water-soluble. Which means leftover amounts will pass body through urine because the body is not able to produce or store vitamin C on its own. The best way to obtain vitamin C is through a diet of fruits and vegetables. Preferably raw and fresh since vitamin C levels will begin to diminish after the fruit has left the plant. Although there are vitamin C supplements, doctors recommend getting all the needed vitamin through a healthy diet of fruits and vegetables as much as possible. Vitamin C is best known to help form and maintain connective tissues, bones, blood vessels, and skin. It also helps heal wounds and forms scar tissue along with maintaining and repairing cartilage and teeth. Vitamin C also helps with the absorption of iron and can prevent the infamous deficiency known as scurvy. Vitamin C is also an antioxidant. Which means it helps the body counteract with free radicals. Free radicals are simply molecules with high oxygen levels and cause oxidative damage to the body. Much like how rust appears on iron when exposed to the oxygen in water. Antioxidants help reverse this process in the body. Since antioxidants counteract free radicals, scientists believe a diet high of antioxidants can help prevent cancers, heart disease, arthritis and even slow the aging process. 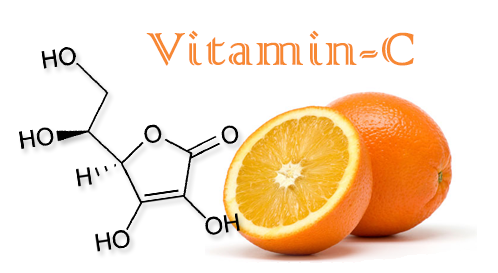 The amount of vitamin C needed for the body has many contributing factors. Woman tend to need more then men. Children need less while adults need more. Pregnant or breasting feeding woman need even more plus your own genetic code may aid or hinder your vitamin absorption rate. If you smoke, NIH suggests you add 35 mg to the suggested dose. Like most things in life, its bad to have too much vitamin C or too little. Vitamin C deficiency, in severe cases known as scurvy, can cause these symptoms:Fatigue, depression, and connective tissue defects such as gingivitis, petechiae, rash, internal bleeding, impaired wound healing. In infants and children, growth impairment is more severe. Most unwanted vitamin C gets flushed out of the body from urine. Its very unlikely for higher doses to be harmful but “mega” doses, such as 2000mg or more for adults a day, can cause diarrhea, nausea, and stomach cramps. Its not unusual for adults to take between 500-1000mg tablets of vitamin C supplements, which isn’t necessary and doctors are unsure if these doses can cause harm to the body.